Recent events have made it necessary for us as a chapter to cite our position on issues of sexuality and gender. Use this link to see our letter on our position of cissexim. On July 10, 2016, the Duluth Branch of the NAACP, St. Mark’s AME and other congregations from CHUM organized a service lamenting the loss of life in July 2016, including Alton Sterling, Philando Castile and the police officers in Dallas. After the service, a number of people in attendance asked for access to what was shared. While this is not a recording of the service, here is an outline of what took place. Here is a version of the song for you to enjoy, sung by Mahalia Jackson. Rev. Coleman,the pastor of St. Mark AME, welcomed people to the service and stressed the need to come together as people of faith to deal with the loss of life and find a sense of hope. President Washington shared reflections on the importance of working to fix the problem of racism, sharing the wisdom of his mother that if we can get a rocket into outer space, we can learn how to get a long with each other.&nbsp; He shared a reflection by a mother, Briana Fisher.&nbsp; He also shared these thoughts from the Cornell William Brooks, the President and CEO of the national NAACP. Activists created the NAACP more than a century ago to fight racialized violence. Then, we called it "lynching." Today, we call it "police brutality," but the effect is still the same — our lives are in danger. Endangered by some of the very people who are called to protect and serve us. We are all tense, angry, devastated, and grieving. We grieve for Alton Sterling. We grieve for Philando Castile. And we grieve with the rest of the country over the senseless loss of lives in Dallas, too — because the execution of police officers does not end the execution of black Americans, and it will not put us on the path to change. What will put us on the path to justice is the passage of the Law Enforcement Trust and Integrity Act (LETIA) and the End Racial Profiling Act (ERPA). Radical reform of policing practices, policies, and laws at all levels must be made — immediately — because the current system is taking too many lives. We can take small solace in the fact that the outrage over this 21st century form of lynching is not isolated to the black community. Americans of all races and ethnicities are fighting to put an end to the epidemic of violence — gun violence in particular — in this country. Now is the time to come together as one in grief, in protest, and in pursuit of real, measurable change. As an organization, we are doing everything we can to ensure justice is served, but we can't do it alone. Stand in solidarity with your fellow activists, hand in hand with your community. Contact your elected officials to demand life-saving reforms to a broken system. We can — and must — put an end to this together. 1 Out of the depths I cry to you, O Lord. 2 Lord, hear my voice! Let your ears be attentive to the voice of my supplications! But you said there was no defense. Rev. Coleman led the congregation in a time of silence and prayer. Words following the shootings in Baton Rouge, Falcon Heights and Dallas. This time of silence and prayer was led by Lee Stuart, Executive Director of CHUM. 6Is not this the fast that I choose: to loose the bonds of injustice, to undo the thongs of the yoke, to let the oppressed go free, and to break every yoke? 7Is it not to share your bread with the hungry, and bring the homeless poor into your house; when you see the naked, to cover them, and not to hide yourself from your own kin? 8Then your light shall break forth like the dawn, and your healing shall spring up quickly; your vindicator shall go before you, the glory of the Lord shall be your rear guard. 9Then you shall call, and the Lord will answer; you shall cry for help, and he will say, Here I am. If you remove the yoke from among you, the pointing of the finger, the speaking of evil, 10if you offer your food to the hungry and satisfy the needs of the afflicted, then your light shall rise in the darkness and your gloom be like the noonday. 11The Lord will guide you continually, and satisfy your needs in parched places, and make your bones strong; and you shall be like a watered garden, like a spring of water, whose waters never fail. 12Your ancient ruins shall be rebuilt; you shall raise up the foundations of many generations; you shall be called the repairer of the breach, the restorer of streets to live in. So much pain. So much suffering. So many mamas, and lovers, and brothers and sisters who mourn the death of men whom they loved. With them our hearts mourn. Not because we knew Alton or Philando or Lorne or Michael or Brent or Patrick or Michael. We didn't. We know our own young men, our sons, brothers, sons-in-law, husbands, fathers, friends. And we love them. Dearly. And because we are human we recognize that our love and the love of the families of those who were shot this week is the same love. So we mourn with them, for lives cut short too soon, for babies who won't know their daddies, for this society where violence is determined to take over as the only way we know to deal with each other. There are many voices declaring this is not what we want. But it seems to be what we have. The word of God declares that there is another way. There is hope that we might not be known for our killing but for our caring. The word from Isaiah says: If you will open your eyes and see the suffering around you and answer it. If you will acknowledge and name the pain, name the racism, name the power of white privilege built into the structures of society, if you will see and listen so you can care for those who suffer – feed the hungry, free the oppressed, welcome the homeless poor into your homes and into your lives – then shall your light break forth like the dawn, then holy light will shine forth from your community. You shall be refreshed and refreshing, like streams and lakes of pure fresh water. You shall be the restorer of the streets; those same streets where guns destroy life shall be the places where life blooms. Those streets that are so broken that black men are not safe there, so broken that police are not peace officers but threats and threatened at all times, armed and ready to kill or be killed. This is not the life that God calls us to. This is not the city of God. Our hearts long to be the repairers of the breach, the restorers of streets where children play and friends meet and visit, where strangers treat each other with deep respect. It's why we are here this afternoon. Being here we name the brokenness, coming together we grieve with those who grieve, we acknowledge that the streets of our cities are broken, torn up worse than Fourth Street by Burrito Union or Sixth Street just outside those doors in late March. God's light shining through us is the repair tool we need. We gather today because we claim the promise of repair, of restoration; we know that another way is possible. We are not there. In Duluth, in Falcon Heights, in Baton Rouge and in Dallas, in Staten Island and Ferguson, we are not there at all. If we will see the pain that is before us, and not shut our eyes or our souls to the suffering of our brothers and sisters, if we are willing to name the racism that infects our streets and the violence that shatters the foundations of our sidewalks and call it wrong, evil and not of God, then we can begin the process of repairing it with jackhammers of justice and asphalt of love. Amen. Here in the silence we breathe God’s gifts of life and breath; here we let our souls sit in God’s true rest. Here as God’s people we call to you and you answer us; answers we receive even when we don’t fully understand, so we may be changed. Let pointing fingers be lowered; let all words of fear be silenced; all acts of hate and violence, stilled. In such space of mercy and grace let us work to repair the breach, to make our streets safe to dwell in. Let that work become our love and worship until the oppressed are liberated, the wounded are healed and all reparations are made. It is well with our souls when we stand in God’s sure strength and are rooted in God’s endless love; then our tears become the healing waters that do not fail. May it be so. The NAACP invites the community to join in the events of the 2016 Twin Ports MLK Arts and Culture Festival. Special thanks to the Northland Foundation for their assistance in making it accessible for the entire community. For more details, visit the Twin Ports MLK Holiday website. A chance to come together in unity amidst our diversity. Funding from the General Mills Community Foundation. Gather at 10:45 AM at Washington Center (corner of 4th St. and Lake Ave.) March starts at 11:00 AM. Route is from Washington Center through downtown to DECC. Rally at DECC begins approximately at 11:45 AM. The rally will be interpreted into American Sign Language and recorded for broadcast on Wisconsin Public Radio - 91.3 FM. U.S. Representatives Keith Ellison (D-MN 5th District) visited Duluth on Monday, Nov. 9 to discuss the “The State of Black America and the Way Forward” before an overflow crowd at St. Mark AME Church. U.S. Representative Rick Nolan, whose district Ellison was visiting, also addressed the audience and participated afterward in a question-and-answer session. See below for full video of the evening's conversation. Xavier Bell, left, moderated a question-and-answer session at the end of the evening. Audience members asked question ranging from the need for housing finance reforms, to broader enfranchisement of minority groups, to disproportionate incarceration of African Americans, to misallocation of financial and political resources to perpetual warfare. The two congressman agreed that the U.S. faces increasing economic disparities that disproportionately affect people of color and groups that continue to experience the effects of racism. Racism, they noted is a divide-and-conquer strategy used to support economic, political, and social inequities. Members of society -- especially working class whites -- who actually have more interests in common with groups lower on the societal pecking order find themselves distracted by these strategies. Thus, confronting and ending racism is everyone's concern and responsibility, particularly if they desire a more equitable society and better future. Eliminating big money in politics as well as transforming the longest war-time economy in U.S. history to focusing on meeting human needs, investing in human development through education and health care, rebuilding crumbling infrastructure, and promoting a more just and peaceful world with environmental sustainability were among other themes the representatives discussed. Photos and summary by David Clanaugh; thanks to Doug Bowen-Bailey for capturing and uploading the video of the evening's conversation. Duluth NAACP Branch members and community members commemorated noted civil rights leaders Julian Bond and George Houser with a memorial ceremony at 2 p.m. on Saturday, August 22 at the Canal Park North Pier. 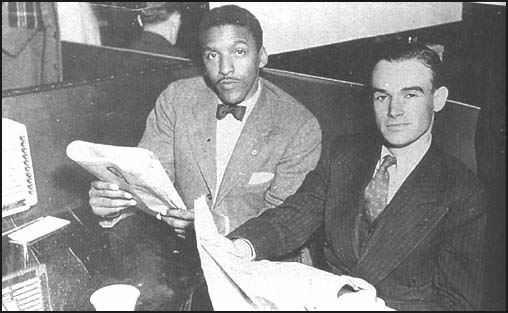 Bond and Houser died during the same week with their shared legacy of advocating for civil rights. 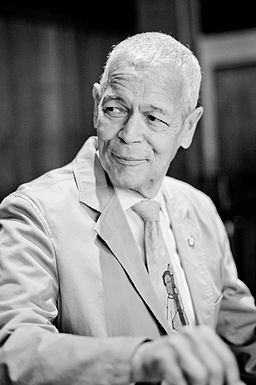 Bond, 75, co-founded the Student Nonviolence Coordination Committee (SNCC), served as a co-founder and first president of the Southern Poverty Law Center, and chaired the NAACP from 1998 to 2010. He also served 20 years in the Georgia Legislature. Bond was heavily involved in voting rights advocacy and increasing political representation for all members of U.S. society. Bond also gave a very inspiring MLK Day address earlier this year that was broadcast during the annual MLK Breakfast in Duluth. People across the U.S. remembered Bond by gathering at bodies of water across the county to spread flower petals. This happened at the same time that Bond's cremains were committed to the Gulf of Mexico during a private family service. Duluth Branch NAACP President Claudie Washington noted that the nation-wide remembrance will provide an opportunity to recommit to the voters right advocacy that was a significant part of Bond and Houser's work and legacy. Washington said much work remains to be done during this 50th anniversary of the Voting Rights Act to not only to secure those rights but to thwart efforts to erode them. Voting, Washington concluded, is a core democratic responsibility that we all must exercise to forge a more inclusive, just, and equitable society.